For over a century now, people from all walks of life have fervently pursued the goal of looking younger through Facelifts. 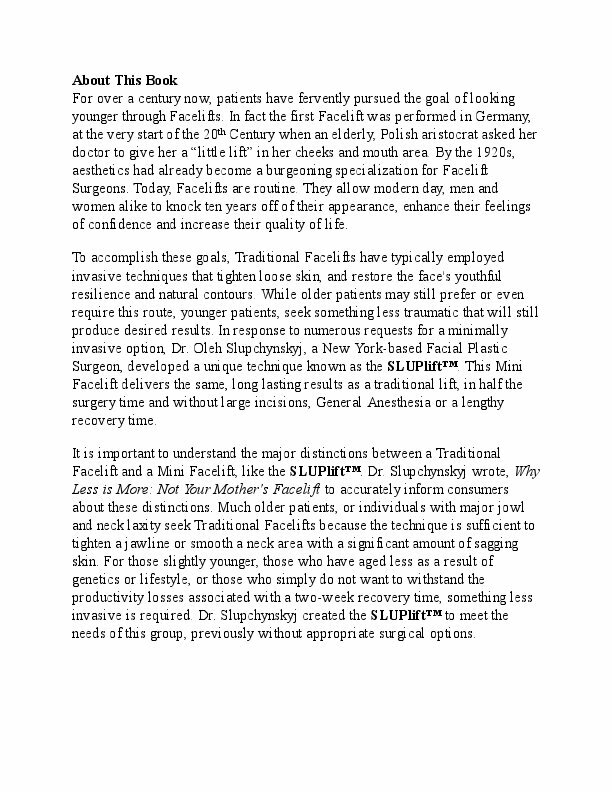 Today, Facelifts are routine and there are numerous Facelifting surgical techniques that are employed. 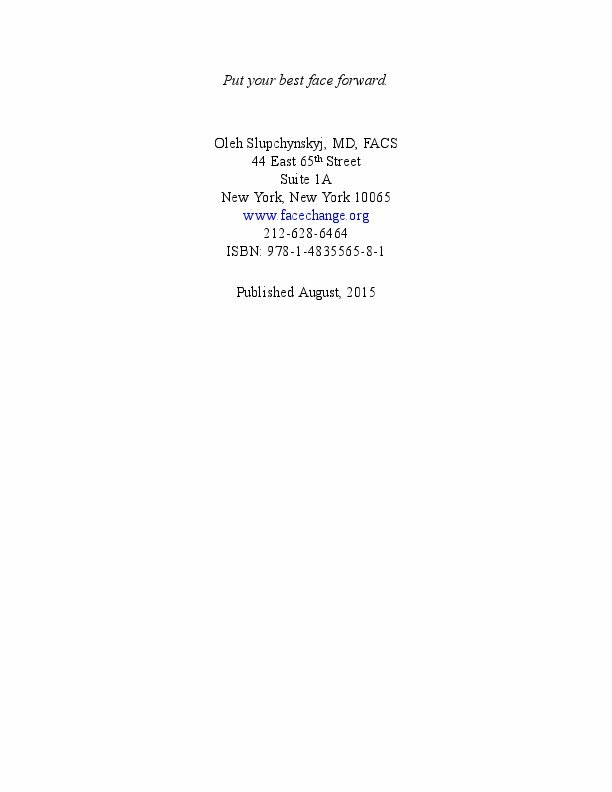 Yet all surgical approaches are not created equally nor do they all deliver stellar results. 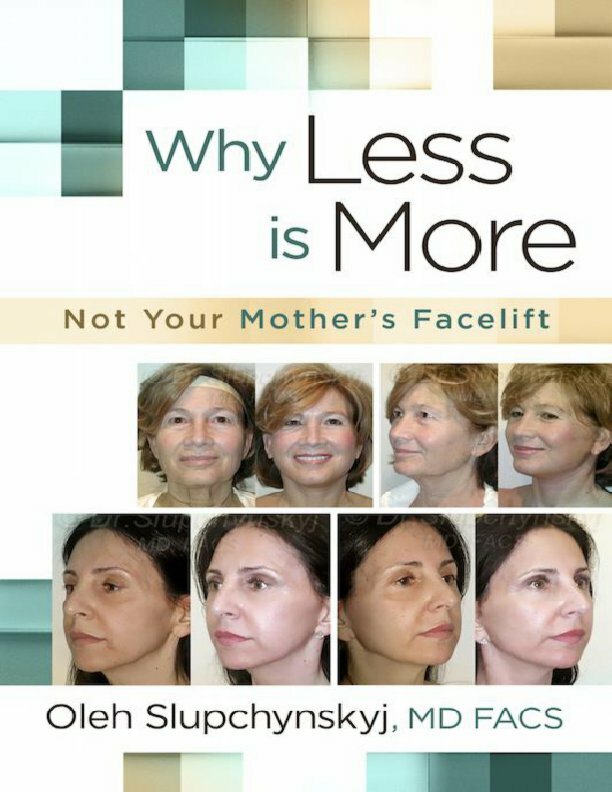 Why Less is More examines all methods of facelifting surgery and details what works, what doesn't and why a "less is more" approach can achieve optimal results that last. For over a century now, people from all walks of life have fervently pursued the goal of looking younger through Facelifts. In fact the first Facelift was performed in Germany, at the very start of the 20th Century when an elderly, Polish aristocrat asked her doctor to give her a “little lift” in her cheeks and mouth area. 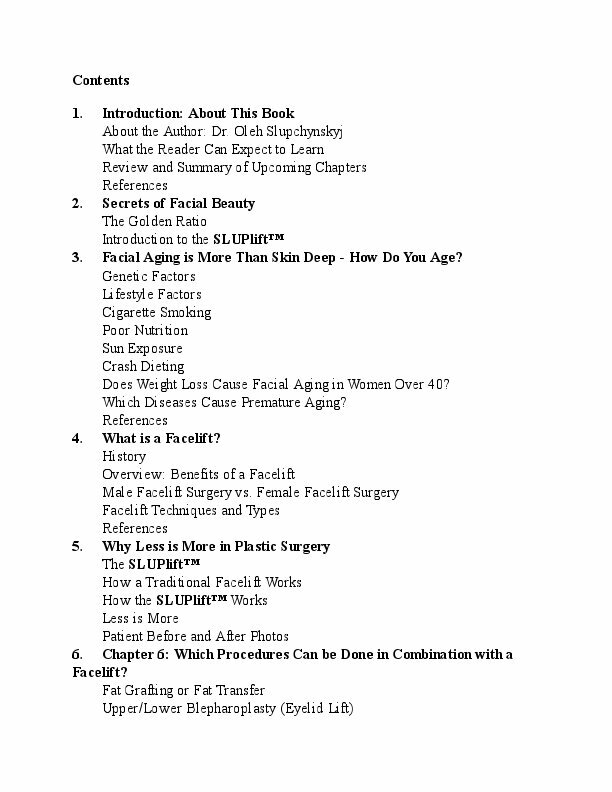 By the 1920s, aesthetics had already become a burgeoning specialization for Facelift Surgeons. Today, Facelifts are routine. 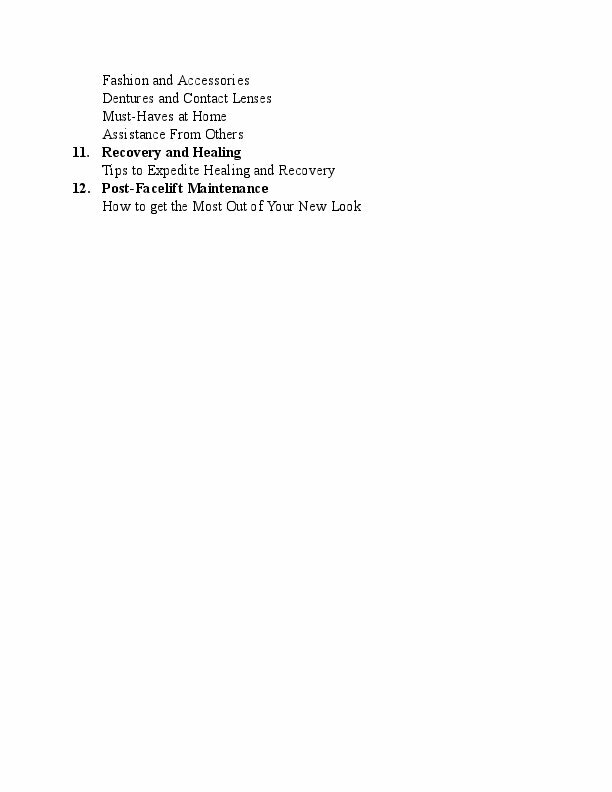 They allow modern day, men and women alike to knock ten years off of their appearance, enhance their feelings of confidence and increase their quality of life. To accomplish these goals, Traditional Facelifts have typically employed invasive techniques that tighten loose skin, and restore the face's youthful resilience and natural contours. While older patients may still prefer or even require this route, younger patients, seek something less traumatic that will still produce desired results. 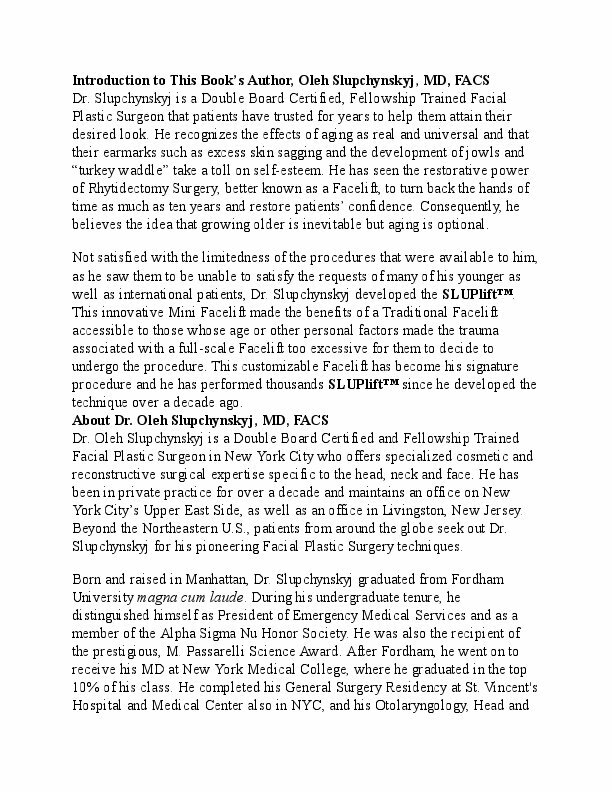 In response to numerous requests for a minimally invasive option, Dr. Oleh Slupchynskyj, a New York-based Facial Plastic Surgeon, developed a unique technique known as the SLUPlift™. This Mini Facelift delivers the same, long lasting results as a traditional lift, in half the surgery time and without large incisions, General Anesthesia or a lengthy recovery time. It is important to understand the major distinctions between a Traditional Facelift and a Mini Facelift, like the SLUPlift™. 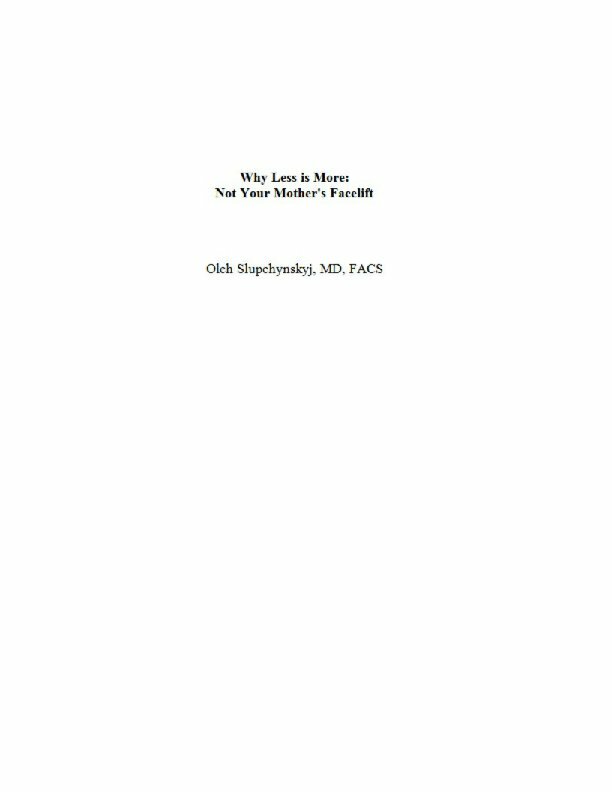 Dr. Slupchynskyj wrote, Why Less is More: Not Your Mother's Facelift to accurately inform consumers about these distinctions in addition to the differences among all facelifting surgical techniques that are employed today. Oleh Slupchynskyj, MD, FACS is a dual Board Certified and Fellowship trained Facial Plastic Surgeon and has been in private practice since 1998. 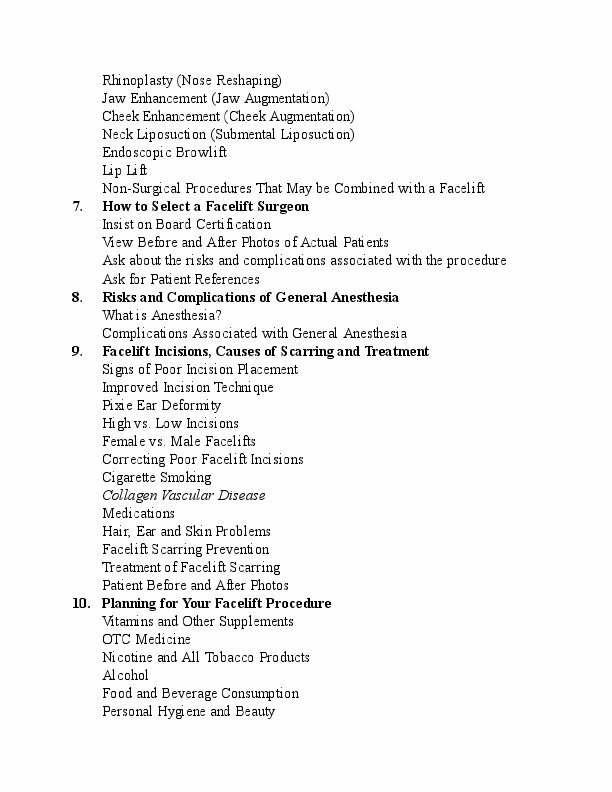 He is Director and Founder of The Aesthetic Facial Surgery Center of New York and New Jersey with offices in Manhattan and Chatham, New Jersey and serves patients from the Northeast Metropolitan area, across the country and internationally. Born and raised in Manhattan, Dr. Slupchynskyj is board certified through both the American Board of Facial Plastic Surgery and the American Board of Otolaryngology. He is named one of America’s Top Regional Doctors for 2012, 2013 and 2014 by US News and World Report, New York Magazine and Castle Connelly Medical, Ltd. His articles have been published in the prestigious Thieme Facial Plastic Surgery Journal and Archives of Facial Plastic Surgery, including his landmark study on how his innovative surgical technique in African-American Rhinoplasty proves to preserve ethnicity, and increase self- esteem. He is the innovator of the SLUPlift minimally invasive mini-lift featured on CBS2 News. 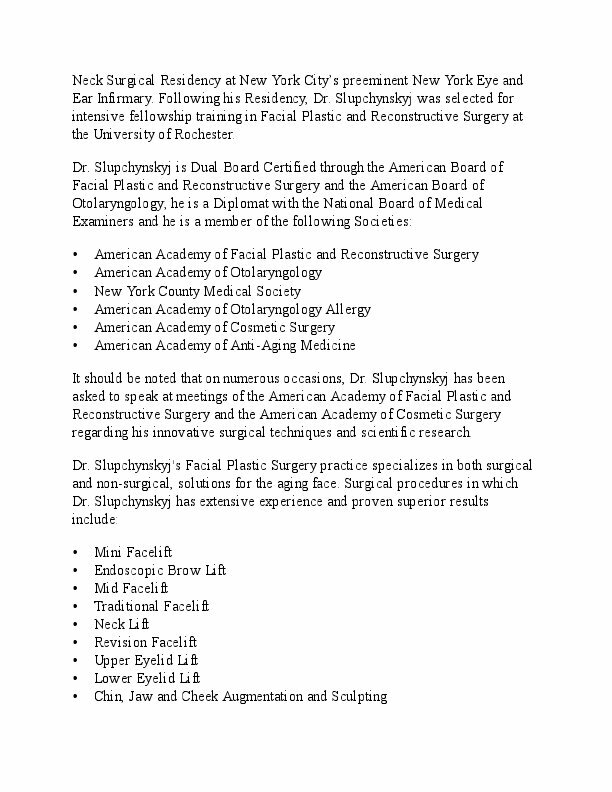 Dr. Slupchynskyj is a Fellow with The American College of Surgeons and member of the following Societies: American Academy of Facial Plastic and Reconstructive Surgery, American Academy of Otolaryngology, New York County Medical Society, American Academy of Otolaryngology Allergy, American Academy of Cosmetic Surgery. 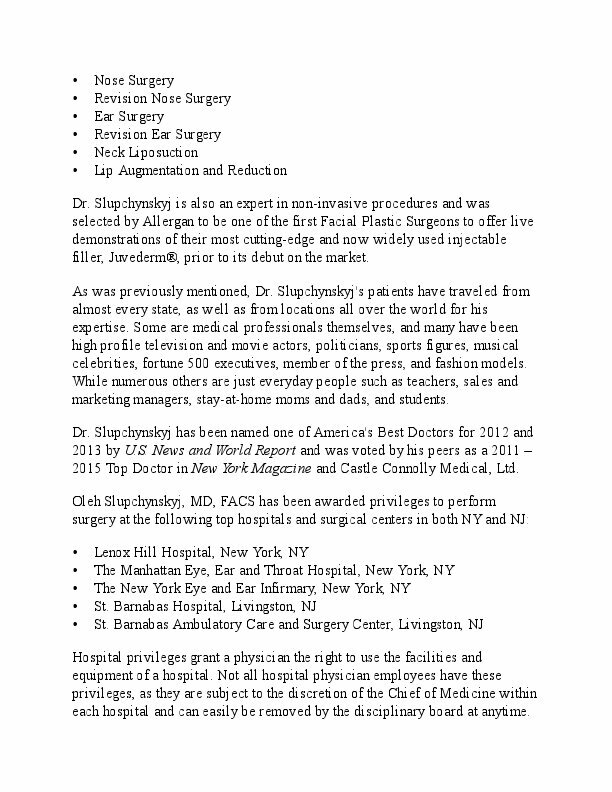 For more information on Dr. Slupchynskyj and his surgical techniques, please visit his websites: www.facechange.org, www.rhinoplastysurgeonnewyork.com and www.africanamericanrhinoplasty.com.